Westgate Village Shopping Center is conveniently located at the southwest corner of Secor Road and Central Avenue and is approximately 1/2 mile south of the I-475 and Secor Road interchange. Westgate Village Shopping Center has some of the most sought after retailers in Costco, Fresh Market, Stein Mart, and Rite Aid as well as the best fast causal restaurants including Starbucks, Barry Bagels, Five Guys, Jamba Juice, Chipotle, Piada Italian Street Food, Wing Stop, Fuzzy’s Taco Shop and Blaze Pizza! 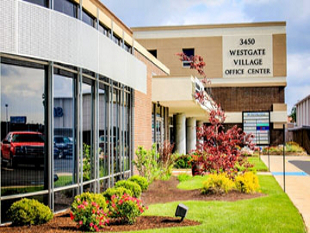 Westgate Village is also home to the Westgate Village Office Center, a three-story professional building located across Central Avenue from the shopping center near Executive Parkway. Recently renovated and professionally managed through its on-site leasing and management office, the Office Center offers full service rental, tenant 24 hour access, patrolled security, free parking, on-site banking, conference facilities and friendly neighbors! Call today to find out how we can help your business thrive! WESTGATE VILLAGE SHOPPING CENTER IS EXPANDING! Visit Piada Italian Street Food, AT&T and Wingstop at 3330 W. Central Avenue! SportClips, Fuzzy’s Taco Shop and Blaze Pizza are NOW OPEN at 3332 W. Central Avenue! For information on the retail opportunity at 3330 W. Central and Phase III, call Tom Walsh at 312-528-7940.